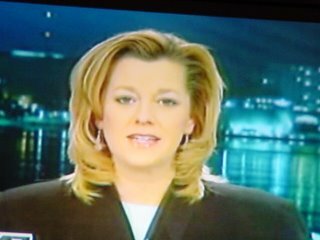 This is one of Madison's news anchors. I have always said St. Louis has the best news channels. That being said, Madison has the worst. It appears that they are taped in someone's basement using dated sets and awkward looking anchors. Where is this channel's stylist? Who let this lady on air with wings, roots, and frosty pink lip gloss?